We know that many pet owners wonder about what it is like to work as a specialty veterinarian or technician, and at Care Center, we pride ourselves on transparency with our patients’ owners. 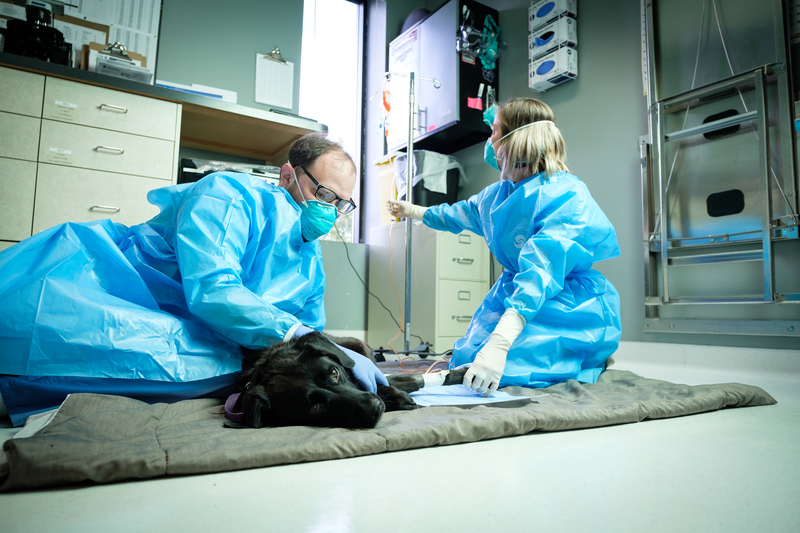 One particular area of interest for many is veterinary oncology. We took a deeper dive into what it is like day to day by interviewing one of our oncology technicians, Meghan Huber, RVT, as she answered some of the tough questions about patient care. What Kind of Education Does It Take to Become a Veterinary Oncology Technician? Meghan Huber studied at Columbus State and graduated in 2012. During her time at Columbus State, she did two different internships at OSU Veterinary Hospital. The first internship included three days in the oncology department at the hospital where she worked with Dr. Bridget Urie. The second internship was a 10-week stay in the oncology department where she really fell in love with the field. We decided to ask her a few questions to help pet owners better understand pet cancer and those who work hard to treat it. Care Center: Tell us a little bit about your typical day. What do you spend the most time doing, what is the flow of your day? Meghan Huber: Our appointments are from 9:00 a.m. to 4:00 p.m.—sometimes with little time in between. Owners are referred to Care Center when their pet has been diagnosed with cancer and they are searching for treatment options. After our Oncologist, Dr. Corrine Camero examines the pet and reviews the diagnosis, prognosis, treatment options, and cost with the owner, they then decide if they would like to pursue any of these options for their pet. We can typically start treatment the same day, but some owners need a couple of days to decide best how to proceed, and that is ok. It is a very emotional, complex decision, so it is part of my job to help guide owners to make the best decision that works for their family. Often, these conversations turn into reminiscing on their pets’ life and how their pet has affected them. I am meeting these owners and families during an emotionally-heightened period in their life, so often we dive right into the personal stuff about their pet and lives, which I enjoy. You just never know what that dog or cat has supported them through. For patients receiving chemo, we make sure a physical exam is performed and any necessary diagnostics (bloodwork, radiographs, ultrasound, etc.) are completed. Administering chemotherapy involves a lot of little steps and requires all of your focus and attention. Working in specialty medicine with oncology patients, it’s important that everything is double and triple-checked, and we are up to date on safety protocols. There are many different types and routes of chemotherapy, from a simple pill given in peanut butter (which dogs love!) to a 20-minute IV infusion. During the infusions, one person is holding the pet stable comforting him or her, while the other is administering. We typically snuggle on a blanket and give lots of soothing rubs to make the experience as comfortable as possible for them. The majority of our pets do very well. Cancer is an unpredictable disease, which often makes our day unpredictable as well. Some days, all of our patients are in remission and doing great (my favorite days! ), and other days are filled with progressive disease, hard times for all, and at times euthanasia. You learn to be prepared for anything, but after six years in this field, those bad days can still be really hard. CC: What about your job is different from other veterinary technicians? MH: One of the main differences is the handling of hazardous drugs on a daily basis. It takes a lot of training and knowledge to know how to safely administer chemotherapy. You never want to feel fully comfortable, and there should always be a sense of caution when handling it in order to do it safely. CC: What are some of your favorite parts of your job? MH: My favorite part of my job is the connections I make with our patients and their families. I wanted to become a veterinary nurse because I loved animals, but I quickly learned that I loved helping people, too. There is a certain type of clientele that veterinary oncology attracts. They are selfless, dedicated, and hopeful. Their pets are a part of the family, and they are willing to drop everything to ensure they are comfortable and happy. I have seen people cancel vacations, take out loans, and cook homemade meals every day for their pet. It makes me happy that, at the end of the day, these pets have lived great lives with amazing people, and I am so thankful that I get to be a part of that. The moment they have to say goodbye, they can hopefully find peace knowing they provided the best care possible. CC: What are some hard or challenging parts of your job? MH: This may sound contradictory to my previous answer but helping owners can also be very hard and challenging due to the nature of why they are coming to see us. It can be a life-altering experience for owners to lose their pet. Sometimes that pet is all they have left after losing a loved one, or that dog saved their child from a fire—yes, that actually happened—or that cat was there to support them through their own chemotherapy treatments. Everyone is faced with their own set of challenges, and animals have a way of lightening the load a little. But, it can be hard for us to know what that person needs in order to cope. We aren’t trained psychologists, but sometimes, I think we would benefit from a course or two. CC: What special training did you receive? MH: I did a 10-week internship in the oncology department at Ohio State’s Veterinary Hospital. I was also trained for 6 months at my previous job before being able to administer chemotherapy. CC: Anything else you’d like to add such as future endeavors or career goals? MH: I think oncology can get a bad reputation for being all death and doom, but it can be very rewarding. Technology is advancing every day, and we now offer a lot of different options for treatment. Chemotherapy is well tolerated in animals and quality of life is our main priority. The positive thing about our four-legged patients is that they don’t know they have cancer, so they remain loving and happy as ever! Care Center is proud to serve pets with cancer in the Cincinnati and Dayton areas. Our Oncology Department offers multiple treatment options and we are here to help inform and support pet owners and patients. If your pet is in need of oncology services, visit our website at CareCenterVets.com or contact Care Center at 513-530-0911 (Cincinnati) or 937-428-0911 (Dayton).